But until we win the lottery, we both have to work, so no lying about in bed on a Monday. 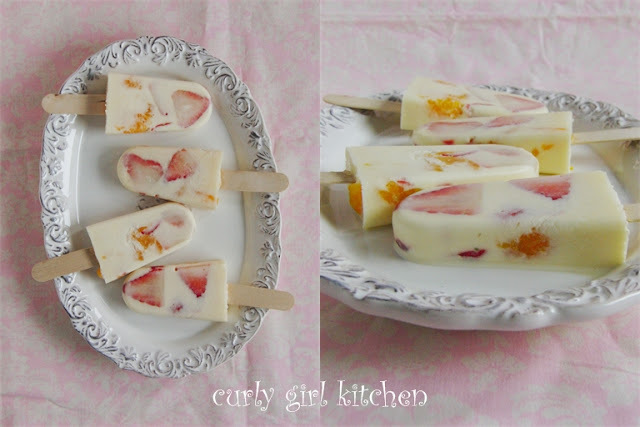 The weather stayed drizzly, chilly and overcast most of the day, and so I made creamsicles. It may seem strange, making a frozen treat on a cold day, but these creamsicles were so lovely that they cheered me right up. 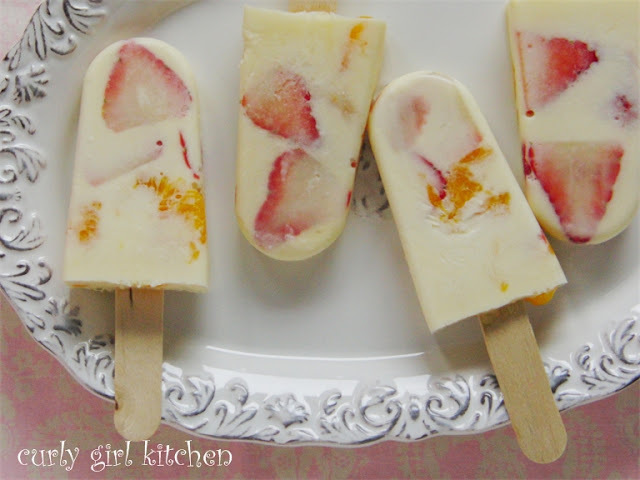 Growing up in South Carolina, popsicles were such a welcome treat during the humid summers. We played outside in our backyard, climbing on the trees that my dad chopped down for firewood for the next winter, roller skating on the rough cement patio behind the house, turning a rickety wooden trailer parked on the side of the house into our "fort", complete with a bucket of water and a cup tied to a string for our "water well", and running all over the woods across the street, pretending to search for hidden treasure using maps we'd drawn of the trees and marshy areas. Inexpensive ice pops stocked our freezer, and after hours of play, my brother and sister and I would grab two or three each, eating one right after the next until our lips and tongues were bright purple, green, orange or red, and the corners of our mouths raw from the edges of the plastic sleeves. Then there were the boxes of fruit flavored popsicles on wooden popsicle sticks; my favorite flavors were grape and banana, so I ate those first, then orange, and lastly, cherry. If we were lucky, we'd get a fudgesicle now and then, too. And while plain orange popsicles were never a favorite of mine, I loved creamsicles. Half ice cream, half orange sherbet, they were the perfect combination of fruitiness and creaminess. I found something similar in China that I was addicted to in the hot summers, a slim popsicle with an icy orange shell filled with creamy vanilla ice cream. 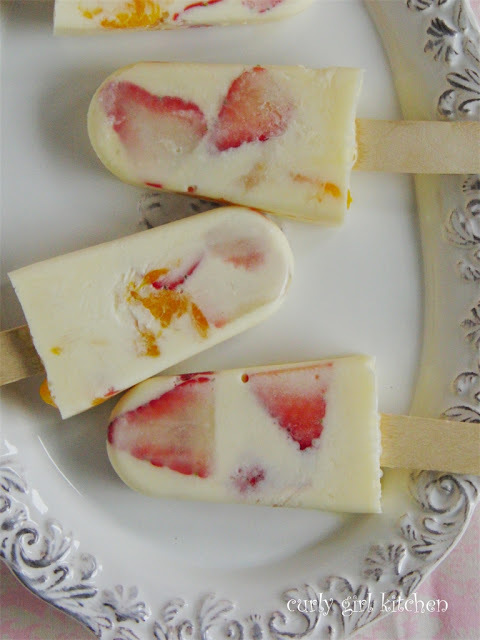 With just four ingredients - strawberries, oranges, orange juice and cream - these refreshing and pretty creamsicles are the perfect cold treat, whether it's hot and sunny or rainy and gray out. And too tempting to eat just one. 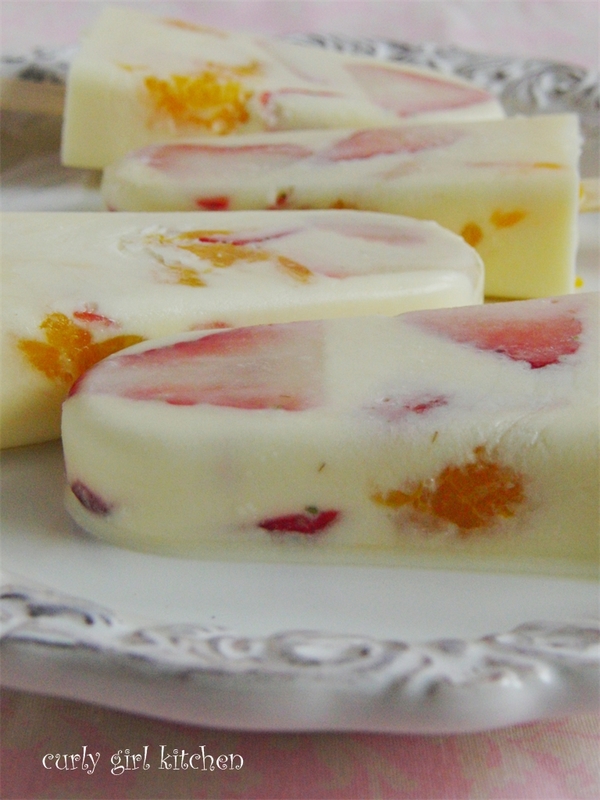 Place the strawberry and orange slices in the popsicle molds. In a glass measuring cup with a pourable spout, combine the orange juice and cream. If you like, you can add a little powdered sugar, but I thought the orange juice was sweet enough without any added sugar. Pour the juice mixture into the popsicle molds. 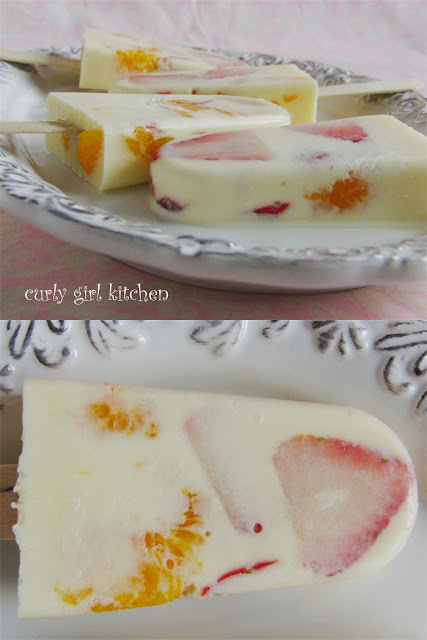 Insert a popsicle stick into each; freeze until firm, about 2-3 hours. 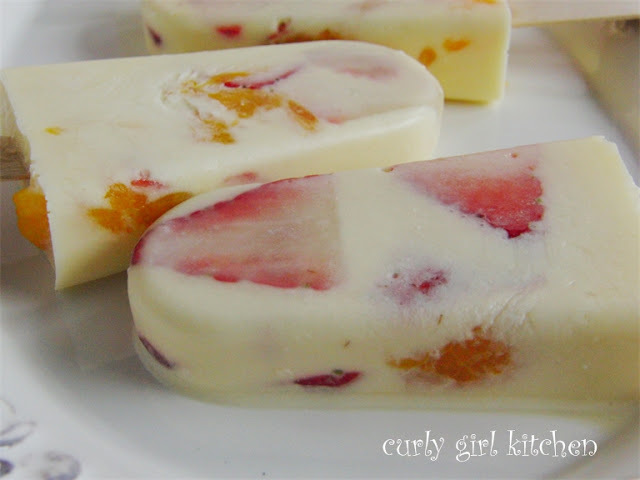 Run the molds under warm water for 30 seconds to loosen the popsicles before eating.